Wit & Delight blogger Kate Arends Peters just launched a limited-edition home collection for Target, the final phase of the company's months-long collaboration with three Pinterest stars. Wit & Delight blogger Kate Arends Peters just launched a limited-edition home collection for Target, the final phase of the company's months-long collaboration with three Pinterest stars. All influential design bloggers, Oh Joy, Poppytalk and Wit & Delight each have millions of followers on the platform. Arends Peters's new line focuses on entertaining: "My inspiration came from the idea of spontaneous get-togethers with your friends and bringing people together in an effortless way," she told us. "I wanted this collection to make it easier to throw 'just because' parties. When I think back to the best parties I've been to, I remember conversations, belly-aching laughter, the good drink, the good food. These parties are less about the occasion, and more about the mood and the company." 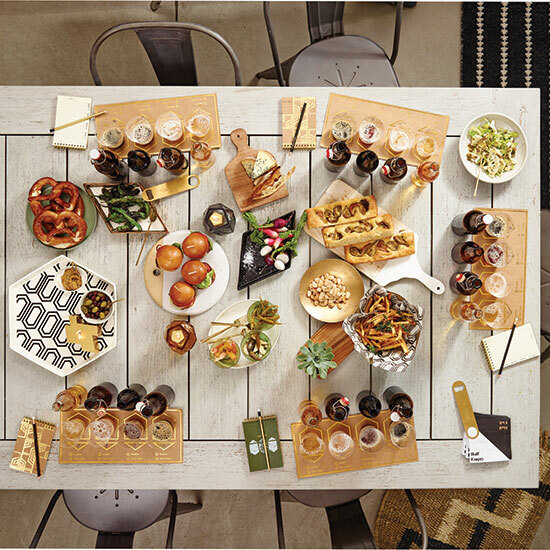 To that end, the line includes geometric ceramic trays and candleholders, paper goods (including a DIY beer tasting kit!) and linens, plus cheeky tea towels printed with sayings like "Beauty is in the eye of the beer holder."